The Terminal’s soaring, rounded arch bisected by stone columns, as well as the fountain out front and the two stolid stone towers on either side are an unmistakable match for the secret meeting place for the all-star DC Comics crew that made its original debut in the 1970s Super Friends cartoon series. Union Terminal opened in 1933 as one of the last great train depots in the nation and was designed to accommodate a super-sized 17,000 passengers and 216 trains a day at its peak. The train depot had been up and running for nearly a quarter of a century before the Hanna-Barbera animation studio, the creative shop behind Super Friends, was founded by William Hanna and Joseph Barbera. And, in a sure sign that there’s a bit of Cincinnati in the place the Super Friends (Superman, Batman, Wonder Woman, etc.) call home, the studio was sold to Cincinnati-based Taft Broadcasting Co. in 1967. The connection grew deeper in the 1980s, when Cincinnati’s Kenner Toys was awarded the Super Friends license and rolled out a “Super Powers” line of action figures, as well as Batmobiles and Batcopters. And, of course, a larger Hall of Justice playset with working elevators and trap doors. While the dead-ringer look of Union Terminal and the Hall of Justice in the Super Friends cartoon has never been officially confirmed, the curious coincidences definitely point to Cincinnati playing a major role in this super adventure. "There have always been legends,” Douglass W. McDonald, then-president and CEO of the Cincinnati Museum Center at Union Terminal told the Cincinnati Enquirer in 2009 about the eerie resemblance and the close working relationship between Taft media and the animation studio’s bosses. "You do Google searches for Union Terminal and you get these funny little hits, but nothing confirmed.” Another clue: a DC series published in 1996 called “Terminal City” used Union Terminal as one of its prominent structures. The animator who drew the Hall of Justice, Al Gmuer, told the paper his original had more windows, but when he turned it over to the network, his sketch was transformed into something that more closely resembled Union Terminal. You can learn more about the iconic building and its Super Friends ties in Newsarama's "Real-Life HALL OF JUSTICE Undergoing $224m Renovation (Don't Call It A Reboot!)" Today, this iconic building is home to three museums and an OMNIMAX® Theater, and is currently undergoing a more than $200 million renovation. Unfortunately, this means that the massive rotunda and much of the inside exhibit space is currently closed to the public until the museum reopens in November 2018. But you can still pull up and get a good look at that classic facade and create your own superhero story! Visit one of the city’s premier comic shops, which has been supplying local comic aficionados with all their action figure, comic book, movie poster, graphic novel and trading card needs since 1987. With more than 50,000 back issues on display at their two outlets and an inventory of nearly 500,000 books, plus the option to have a customized file created so that your favorites are set aside for you every month, Queen City Comic has all your Justice League needs covered. The birthplace of American astronomy is the perfect spot to gaze up into the heavens in search of the remnants of Superman’s home planet Krypton. While nationally known astronomer Dean Regas may not be able to point you toward the Justice League Satellite located 22,300 miles above Earth, he is the co-host of the nationally syndicated PBS series Star Gazers and he’s a super nice guy who loves to share his knowledge of the universe with curious stargazers. Though it was moved to California in in 1960, the body of the original TV Superman, George Reeves (Adventures of Superman), was interred in the Spring Grove chapel for four months from late 1959 to early 1960. The picturesque cemetery is also home to many Civil War figures, as well as one of the city’s favorite sons: late horror movie late night host The Cool Ghoul. As long as we’re going back to the future to the 1970s heyday of Super Friends, why not visit this 20,000 square foot homage to all things neon? 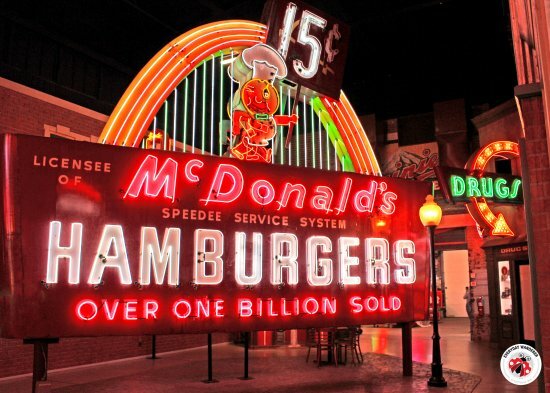 One of the largest displays of its kind dedicated to signs that glow and hum, it features more than 200 signs, including a 1963 McDonald’s Speedee one that has the chain’s mascot standing under golden arches that look suspiciously like the signature curve of Union Terminal/Hall of Justice. The beloved downtown skyscraper that has a decidedly Gotham feel inspired a scene from hometown hero George Clooney’s latest directorial effort, Suburbicon. Climb to the top of the city’s tallest building to channel a bit of Clooney, who, it’s worth noting, played Batman in 1997’s Batman & Robin. Yes, Jason Momoa is getting his own stand-alone Aquaman movie in Dec. 2018, but first he’ll swim into the mix in Justice League. Fittingly, the Newport Aquarium has just announced its own super-charged new underwater exhibit, “Ring of Fire,” which will launch in March 2018 with a giant octopus (the kind Aquaman loves to wrestle with), as well as moon jellyfish and Japanese spider crabs. Glide on over for a feel of what it’s like to be the king of the sea. Cincinnati’s premiere old-school arcade/bar has plenty of opportunities to feel like a joystick superhero, thanks to such iconic games as X-Men, Marvel Vs. Capcom and T2. The drink menu isn’t too shabby either, with pumped-up action star-themed drinks including the Patrick Swayze, Dolph Lundgren, David Hasselfhoff and Hulk Hogan. The legendary amusement park will make you feel like you have super powers once you strap into such thrill rides as The Vortex (55 mph, two vertical loops, double corkscrew), The Bat (one of the first hanging coasters), Invertigo (face-to-face inverted coaster that tops out at 55 mph) and Firehawk (115 feet in the air, five inversions). And don’t forget the Extreme Skyflyer, which gives you the thrill of hang gliding and skydiving at the same time at speeds up to 60 mph as you free-fall 17 stories to the ground. Time your visit for September and you can share your love of all things DC (and Marvel, if that’s your thing) with thousands of others at this annual gathering of movie, TV and comic super fans. Panels, workshops, signings, cosplay competitions, gaming, geek proms and so much more! For more information to plan your superhero trip, visit http://cincinnatiusa.com/.